Hillary Clinton paid to hide the identity of the people running her private email server, Breitbart News has learned. Her attempt to hide details about her server has allowed another faceless company access to her classified email information, while doing little to nothing to secure that information from hackers. Clinton’s private email domain clintonemail.com was initially purchased by Clinton aide Eric Hoteham, who listed the Clintons’ Chappaqua, New York home as the contact address for his purchase. But the domain is actually registered to an Internet company designed to hide the true identity of the people running it. Clintonemail.com is currently registered to a company called Perfect Privacy, LLC. The company has a listed address of 12808 Gran Bay Parkway West in Jacksonville, Florida. But don’t try to get someone from “Perfect Privacy” on the phone. The company merely serves to mask its clients’ personal information by providing its own meaningless contact information on official databases. “We won’t reveal your identity unless required by law or if you breach our Perfect Privacy Service Agreement,” the company explains. The Jacksonville address listed for Perfect Privacy, LLC is actually just the headquarters for Web.com. It is an unassuming gray building just off Interstate 95. Breitbart News called a number listed for Network Solutions and, after some on-hold elevator music, an operator confirmed that clintonemail.com is one of the domains that it manages. The company has access to information in the account. But the company does not provide any kind of security for the domain, and instead encourages its clients to buy a standard Norton AntiVirus package like the kind available at retail stores. Network Solutions, the operator explained, can identify major hacks and can access and change information related to the email account in the event of a hack. The company declined to provide more information without speaking to the domain’s administrator. As Breitbart News revealed, Hillary’s email account clintonemail.com was operating with the same IP addresses as presidentclinton.com, an email account managed by the private Clinton Foundation and used by top Clinton Foundation staffers. The IP addresses were based in New York City, meaning that they were sharing the same email network at the same physical location, likely at one of the Clintons’ Midtown Manhtattan offices. Additionally, Chelsea Clinton’s work email account chelseaoffice.com was sharing the same email server. wjcoffice.com, an email account used by Bill Clinton staffers, including his former communications director Jay Carson, also shared the same IP address as clintonemail.com. Breitbart News has also discovered that clintonemail.com and presidentclinton.com were using the same IP port: port 443. That Hillary Clinton shared a server with the Clinton Foundation and the offices of her husband and daughter raises further concerns about the illegality of her private email use, since other Clinton-World employees not affiliated with the State Department certainly had physical access to her server and the classified information on it. 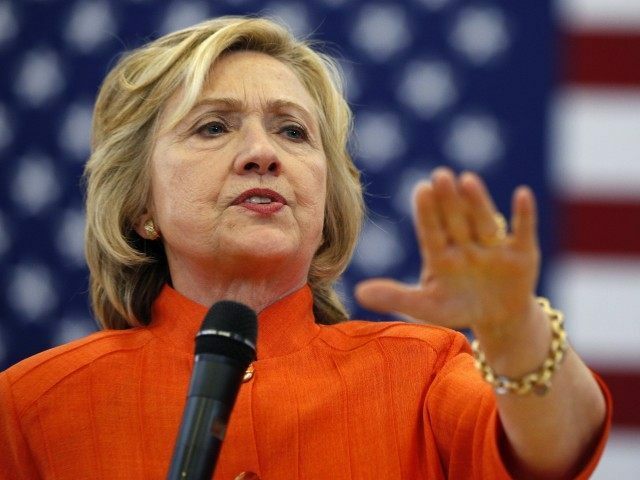 Hillary’s private server also used the McAfee-owned MXLogic spam-filtering software, which is susceptible to a security breach and which made the information on her server accessible to McAfee employees during the numerous intervals in which her emails were passed through the MXLogic system. The server was prone to crashes. Hillary Clinton’s private email server went down in February 2010, and the State Department IT team didn’t even know that she was using a private email address, indicating that Clinton Foundation staff was working on her server as opposed to the agency’s IT professionals. After the State Department Help Desk sent Clinton’s private email address a routine warning notifying her that her messages were being flagged with fatal errors, Hillary’s top aide Huma Abedin sent the Secretary an email explaining to her what was going on. Hillary’s server went down again during Superstorm Sandy in 2012.